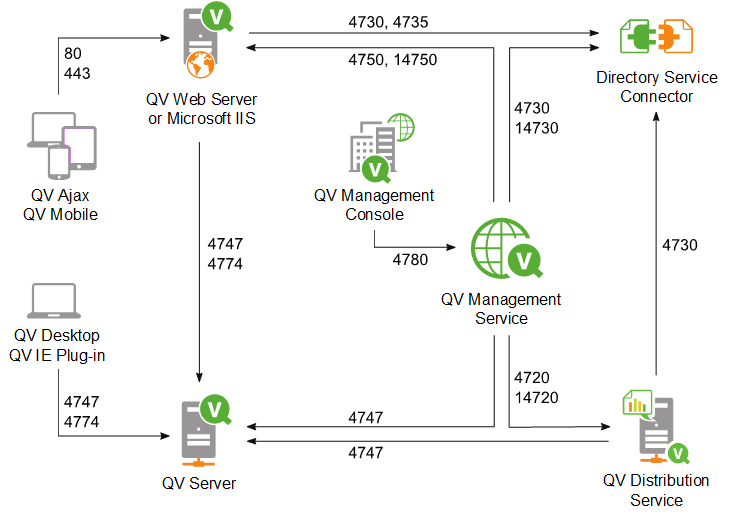 QlikView uses ports to communicate between web browsers (users) and servers, and between different services in single or multi-node deployments. The following table provides an overview of the ports used in a QlikView deployment. The following example shows the ports used to connect the different QlikView services. In a QlikView deployment, all these services can be installed on the same server (single-node deployment). Alternatively, you can decide to set up a multi-node deployment, and install different services on different servers. For further information about QlikView architecture and deployments, see Architecture and Deployment pages.